QUESTION: I have diabetes 2 and I do not take medications for it at this point. Initially I was fine monitoring my sugar levels. Now my sugar level in the morning is too high...I feel crumby, have blurry vision and do not feel like eating...what is happening? Blurred vision and feeling crumby are symptoms which are characteristic for several diseases. In your case, it could be because of the high blood glucose level. One of the most common diabetes complications is diabetic retinopathy, characterized by blurred vision. The reason you are not feeling hungry is because there is too much glucose in your blood and your organism doesn’t want more. I want just to remind you that diabetes type 2 is appearing as are result of progressive beta-cells (the cells which are producing insulin) destruction or impaired glucose tolerance. For that reason, at some point, you may have normal insulin secretion which is leading to normal blood glucose level in the morning. But, if you measure your blood sugar after a while, your insulin secretion is reduced because of the massive beta-cells destruction. In addition, several more factors might affect the blood glucose level no matter the secretion of insulin. For example, there exist several other hormones, except insulin, which are affecting the blood glucose level, including glucagon, cortisol, adrenalin, sexual hormones and others. Their action is the opposite of insulin, i.e. increasing blood glucose level. Although their amount is changing every hour, there is a balance between these hormones in our organism. For example, early in the morning there is an elevation of glucagon, cortisol and adrenalin. Their elevation is observed 10-15 min after getting up from bad. In particular, if you are getting up at 7 in the morning, the elevation is going to be observed in 7:10-7:15, and if you measure your blood glucose at that time, it is going to be a little bit elevated. Other hormone important for the blood glucose level is progesterone. The secretion of this hormone is reduced during the menopause, which is causing a lot of symptoms like hot flashes, vaginal dryness and others. Some of the doctors are prescribing this hormone at the form of pills in purpose to reduce the symptoms of menopause. Contraceptives also contain this hormone; as a consequence, the women who are taking contraceptives are having high blood glucose because of this hormone. long chemical structure which is making them difficult to be absorbed. Because of this the organism need more time to transform them in molecules suitable for absorption. This later absorption leads to high blood glucose level in the morning. It is the same situation as you were like to get up at 3 o’clock to eat something. After the above-mentioned explanations, there are several things, which you can do in purpose to reduce your blood glucose level in the morning. 1.First of all, try to eat low carb foods at dinner, like tomatoes, cabbage, cucumber, chicken meat, fish and others. 2.Other important thing is to do some exercise in the evening. Running for half an hour will reduce the glucose level in the morning, because a part of the glucose is going to be used for energy. 3.It is good for you if you try to use medications and herbs, which will reduce the blood glucose amount. You have to know that all of the drugs used for the treatment of diabetes type two are prescribed only by doctors. Most of the drugs are at the form of pills, which is more comfortable for the patients. At some point, the patients with diabetes type two are supposed to inject themselves insulin, but this is obligatory only in the advanced staged, because there is no insulin secretion in the human body. 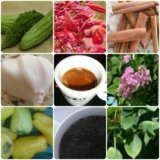 With regards to the herbs that can lower blood glucose, some of them are: cinnamon, bitter melon and gymnemaa sylvestre. Cinnamon is very effective in patients with diabetes type 2 and it is reducing not only the blood glucose level, but even A1C. As you probably know A1C is showing how diabetes is controlled in the past 2-3 months. Drinking only 50-60 ml of bitter melon in the morning will get your blood glucose sugar back to normal. Besides this, bitter melon is containing a lot of antioxidants which are protecting your body from the bad effect of the free radicals. Gymnema sylvestre is herbs which is able to reduce the blood sugar in patients with diabetes type one and two. I have to inform you that these herbs are clinical tested at some point, but still they are not approved by FDA. For that reason their side effects are unknown. 4.It will be good for you to measure your blood glucose every morning for 3-4 days, record the results and then, present them to your doctor. It is important to inform him/her about your condition, because your doctor would be able to put you on the correct therapy for the best control.